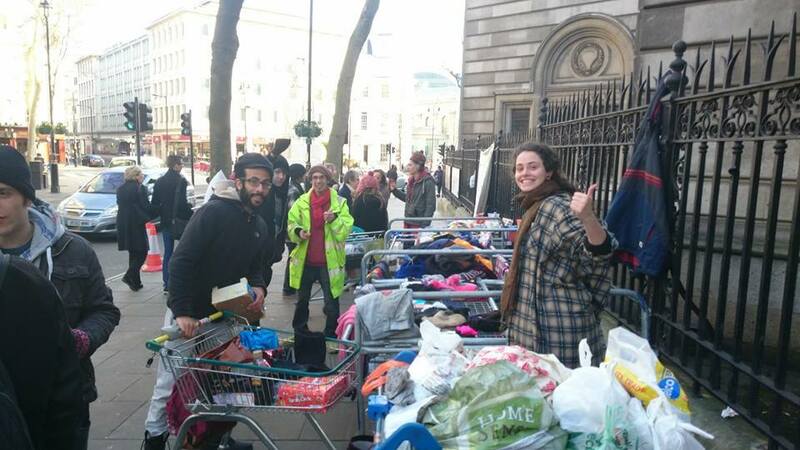 A group of squatters, known as the “Love Activists”, have provided an uncooked Christmas lunch to homeless Londoners on the pavement outside the former bank they had been occupying, after they were evicted from the premises on Christmas Eve morning. They have vowed to continue their protests. The group of 20 activists occupied the imposing grade ll listed building on the corner of Charing Cross Road and the Strand that previously housed an RBS bank, in the early hours of Saturday morning, saying they found an open fire escape door. All say they are homeless and occupied the building to raise awareness about the epidemic of homelessness in London especially amongst young people. There were 6,437 people sleeping rough in London last year, an increase of 8% on the figure two years previously. Many of those, like the Love Activist team, are young people. The prime site building is owned by Greencap Ltd, a company registered in Jersey and which, according to the accounts it filed earlier this year, is valued at just £9!!!!!!!!!!!!!!!!!!!!!!!!!!!!!!!!!!!!!!!!!!!!!!!! [My exclamation marks] Until June 2013 it was leased to RBS. Greencap had obtained an emergency, no-notice injunction to remove them from the premises. Most recent message from the group. We have now officially set up outside love HQ, 2a Charing Cross Road. Everyone please come on down and invite any homeless people you see for free food and clothes.